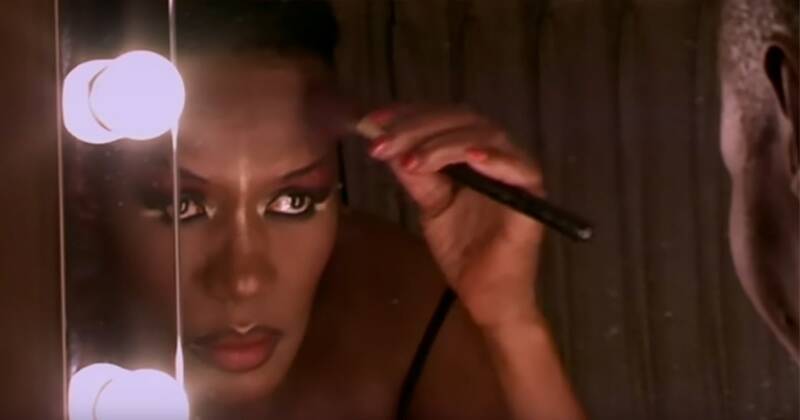 Now in her late sixties, Grace Jones has been around the block for more than a little while. Notwithstanding that fact, she still retains her magnificent figure; her androgynous facial features remain hauntingly unique. This biographical insight into her life was apparently shot over a period of ten years. There are scenes in Paris and New York but a substantial part of the film is concentrated on a stage performance in the Olympia theatre in Dublin and with her friends and family in Jamaica, where she started life. Fiennes eschews interviews with friends and family of the talking heads variety. As is to be expected given her powerful personality, Jones dominates almost every scene in the film. However, when she does her routines on stage, notwithstanding her awesome vitality, the years intrude. It is still impressive but it is not as magnetising as what she did in the past. No one who has lived life to the full as she has done is going to be able to move her limbs as mesmerizingly as she did in her earlier years. What she does is still remarkable but somehow it cannot avoid alluding to her former glory. The problem of being as famous as she has been is that her audience retains their memories. The scenes in Jamaica with her family and friends are not all that easy to follow but her step grandfather Mas P, whom she hated, does not get good press. There are many people who are introduced and reference is made to even more personalities during the conversations. Added to which as you might expect with family and friends the participants have a tendency to speak at the same time, making comprehension not that easy. The result is that the viewer tends to be the proverbial outsider at these family gatherings and is therefore at a bit of a loose end. The film lasts almost two hours which is a comparatively long time, considering the amount of time given to the often difficult to follow family material. One of the first credits is given to Philip Treacy as the creator of the hats which Grace wears. Certainly they add a great deal of panache to Jones’s gear and give the entire film a genuine sense of high fashion. They complement the visual glory of Jones as she dominates the stage. But by her own high standards, the years have diminished her visual impact. However, one of the Treacy hats gives Jones an opportunity to show her generosity of spirit as in a magnificent hat-box she presents, as a gift, one of these fabulous Treacy concoctions. It demonstrated a personal warmth which is not often that visible. Although all footage has been created for the film, throughout the dialogue there are many references to times past. So there is a certain nostalgia inevitably latently lying beneath the endeavour. That raises the question of what the underlying motivation for making this film was. Like much else about Grace Jones the answer, if found, is likely to be enigmatic. She remains her own, difficult to define, woman.